A good system cleaner does its job and doesn’t bother you with confusing details. System Healer focuses on removing junk files you don’t actually need. It deletes irrelevant data such as broken links, unused shortcuts, and other unnecessary files. You can see exactly what is slowing your Windows system down and prevent it from ever crashing again. The Reports feature will issue you a clear and logical report about the status of your PC whenever you want. And it’s fully customizable. Make your system maintenance a part of your automatic and daily routine. It’s easy to set up a schedule for scanning and inspecting your system registry for common errors that slow it down. Automatically scan your PC daily, weekly, bi-weekly, or even monthly. By cleaning unused files from your computer, System Healer allows your PC memory to be used more efficiently. With more memory available, your system will be balanced, stable and aligned with its inner components, drivers and hardware. Always use backup. By creating backup and restore points, you will be able to make as many changes to your computer as you want. All you have to do is use this feature so that you can restore your system when you need to if your system crashes. Forget about system crashes. Don’t stress over your slow PC. Let System Healer not only clean your computer, but also improve your life. It was built with the most up-to-date technology on the market. Other PC cleaners are still using old methods to scan and detect system issues. 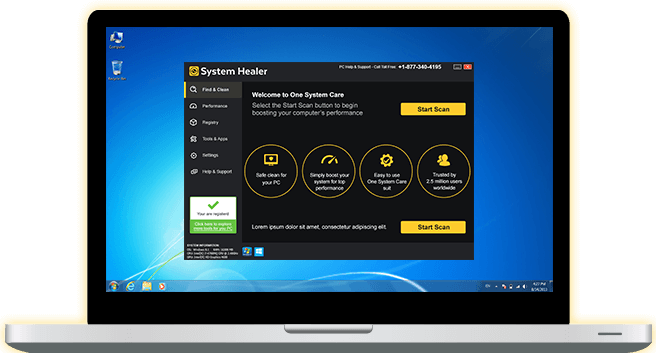 System Healer has a faster and stronger, more advanced way of finding and eliminating the issues that other PC cleaners can’t detect. By now, you must be wondering what this free to download and install PC cleaner can do for you. It’s really simple. Try it out now and scan your Windows system from top to bottom. Buy a license key to register your product and activate the cleaning technology. In a matter of moments, your PC will be breathing better, running smoother, and working healthier. With a strong user base, this is one of the newest and best PC system cleaners available for such a great price. If you don't like it, you can get a refund. Continuously being updated and tested in multiple test-environments. This software product has been proven time and again to deliver you with amazing results. With round-the-clock support, you can always trn to our experts for help and advice concerning your system's healer and performance.Contact us at any time. It’s amazing how fast that was. I bought a key and it was worth it. I’ve found the tool for me. System Healer is a really good program. Works well. No ads. Easy to use. System Healer is probably the best downloadable software of its kind that I’ve ever used. I recommend this software for anyone who needs a quick fix for their PC. It doesn’t have a lot of confusing features, it just gets the job done. I like my computer super clean and I’ve tried a lot of tools. I recommend System Healer because it’s the newest version on the market and that’s important to me.